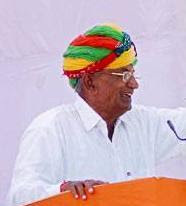 Nathuram sinodiya is 3 Times and Current MLA from Kishangarh in Rajasthan and one of renowned Jat Leader in Rajasthan. He is a farmer by occupation and belogs to a village nearby Kishangarh. He is elected MLA from Congress party. Recently one of his son is abducted and Killed by Land Mafia in Rajasthan. He is real jat as per person known to him.